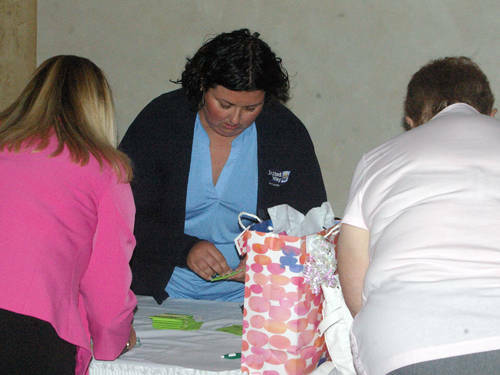 Darke County United Way Executive Director Christy Bugher (center) takes donations for the 2019 campaign following the United Way’s campaign kick-off on Wednesday at Romer’s Catering in Greenville. DARKE COUNTY – The Darke County United Way hopes to follow up a record-breaking 2018 campaign with an even bigger campaign in 2019 that will help fund two new major initiatives. The United Way kicked off its 2019 campaign season on Wednesday at Romer’s Catering in Greenville with dozens of community and business leaders in attendance. The 2018 campaign raised more than $670,000 – a record for the Darke County United Way – and the organization hopes to exceed that number this year. The funds – 88 percent of which go to program costs – served more than 14,000 clients in Darke County last year. More than 9,000 clients are in Greenville with hundreds in the communities of Ansonia, Arcanum, Bradford, New Madison, Pitsburg, Versailles and Union City. United Way funds help dozens of partner programs throughout Darke County, but the increased giving has organizers in Darke County looking to expand services available to the community. The new major initiatives the Darke County United Way is pursuing this year are 211 and the Darke County homeless shelter. The 211 program is a United Way initiative that provides a 24-hour hotline for community members seeking assistance. Darke County is one of the last counties in Ohio without 211, but the United Way hopes to launch it locally in early 2019. The United Way currently is seeking a grant to cover the 211 start-up costs, which will be about $12,000 to $15,000 dollars. The Darke County United Way is partnering with Community Action Partnership to raise funds for a new homeless shelter in Darke County. The county’s current homeless shelter lacks adequate space and isn’t handicap accessible. Community Action Partnership is leading the homeless shelter project, but the United Way is helping raise funds to make it possible. “We will just be kind of ancillary to that,” Bugher said. “We’ll come alongside them for the fundraising piece of that. They’re so busy doing the day-to-day work that that fundraising piece is going to be a challenge, I think, for them and so anything that we can do to help; that’s probably one of our No. 1 referrals, is for homelessness in our community, and so anything we can do to help lessen the burden of that financially we would like to help them with so they can just concentrate on that case management piece and that programming piece. To fund the major projects and partnerships, the United Way relies on donations from local businesses and individuals. Last year Whirlpool Corp.’s employees donated more than $400,000 to the United Way – making it the largest contributor to the Darke County United Way. Along with more than 80 corporate campaigns, the United Way accepts donations from individuals. Last year more than 50 individuals gave $1,000 or more while many others gave smaller amounts. Anyone who is interested in learning more or donating to the Darke County United Way’s 2019 campaign may call the agency at 937-547-1272, visit its website at www.darkecountyunitedway.org or visit its Facebook page. This entry was tagged United Way. Bookmark the permalink.